It’s time to step out your comfort zone and try on French chic style! In today’s article, I decided to give you amazing inspiration from Parisian street style outfit ideas. You are about to see simple tips and tricks on how to dress like a real French woman. Be ready to see fabulous and refined outfit combinations on fashion bloggers, models and style editors. By the way, check out my post on how to look like a real French woman this year. Before we move on, I wanted to mention two very important aspects: focus on interesting textures and silhouettes and keep sparkling items to the minimum. A crimson color oversized sleeveless coat is worn atop lace LBD. The look is completed with suede black knee-length boots, clutch handbag, and rounded sunglasses. A touch of classics is felt in the following outfit, consisting of a gray Prince of Wales printed blazer worn with a semi-sheer white blouse and bootcut jeans. Add brown brogues and a silver metallic envelope clutch to complete this outfit. The gray full pleated skirt ideally matches a slim-fit navy sleeveless top with a skinny brown leather belt. Complete this office-friendly look with a navy blazer and classic black leather pumps. A silken black slip dress with sheer lace embroidery looks stunning under the edgy black leather jacket. Add cream-gray heeled sandals and bright red leather clutch to complete this urban street style outfit. Another cool way to wear a leather jacket, this time the whole appearance is more urban and casual. It’s worn over a graphic print gray T-shirt paired with black skinny jeans and lace-up flat boots. A true French chic outfit. We see a beautiful black beret styled with long sleeve black dress layered under a belted vest. Complete this look by adding black tights and OTK suede boots. A camel coat is ideally draped over a black pantsuit. Add black pullover, brown leather ankle boots, and aviator sunglasses. If you can’t decide what should you wear for casual Friday walk, then why don’t you give a try to this black-white blazer worn over black top tucked in black slim-fit jeans. Complete this mannish outfit with a pair of black leather loafers and quilted black leather clutch. I am so in love with this smart-casual look. A brown suede coat matches high-neck beige top tucked in knee-ripped black skinny jeans. Complete this outfit with a pair of black block-heel loafers. If you are tired of wearing slim fit clothes, then try on this gray oversized coat styled with a ribbed knit green long scarf, black skinnies, and lace-up ankle boots. A touch of boho! Black floral midi dress and dark yellow jacket. How about mixing boho-chic style with French spirit girl. 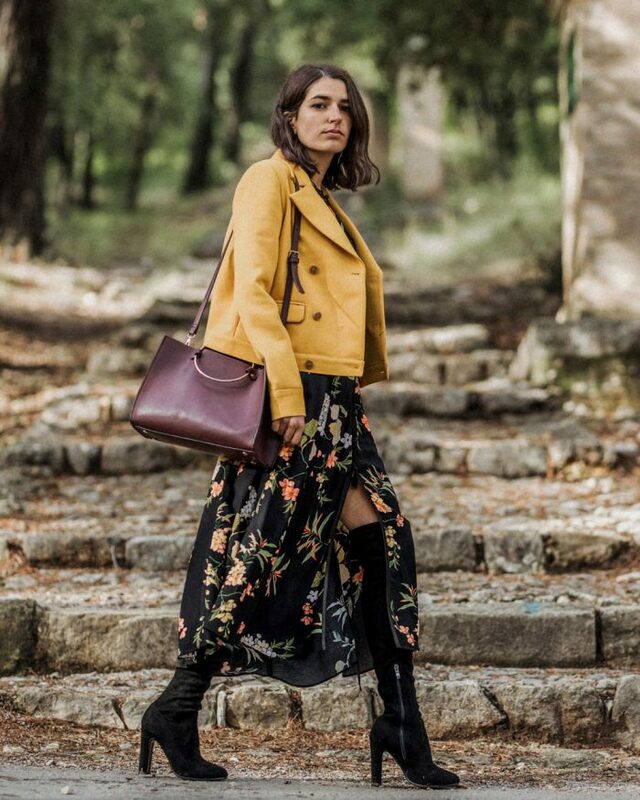 You will need a dark yellow short jacket, black midi dress in floral print and OTK black boots. I am so in love with this simple combination. It’s so easy to pair a striped white top with black slim-fit trousers. Complete this combo with a black leather jacket and lace-up black pumps. Indeed, this combo might seem simple, but I love it for a kind of sophisticated touch thanks to the navy blazer in white vertical stripes paired with a graphic print white top tucked in black skinny trousers. Add stylish black-white sneakers to create a fabulous sporty touch. A maroon colored pantsuit will make any lady look professional. A perfect choice for office ladies. Go for a slim fit burgundy suit and add black leather pointed-toe pumps. Another sporty touch we see in this outfit. Lady appears in a beige cream trench coat worn atop gray hoodie paired with black track pants and black-white trainers. Yes, I know, another sporty touch! But the outfit does look awesome! You will need a black leather biker jacket, a gray pullover, cream white skirt, and white kicks. Complete this look by adding a pastel turquoise backpack. Another French chic outfit. 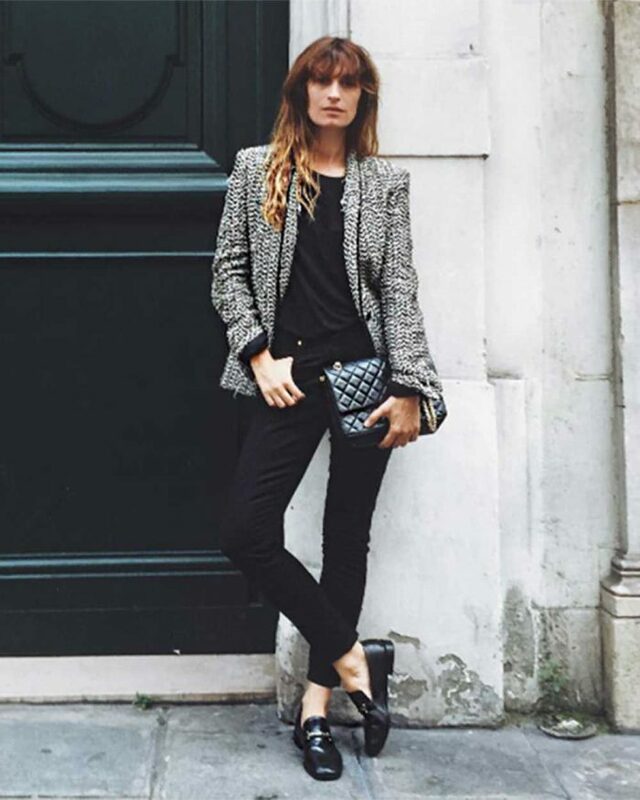 It might look like a cliche, but I love this Parisian style combo. The striped dress ideally matches the black coat. Oh, I do love to see menswear basics mixed with feminine essentials. 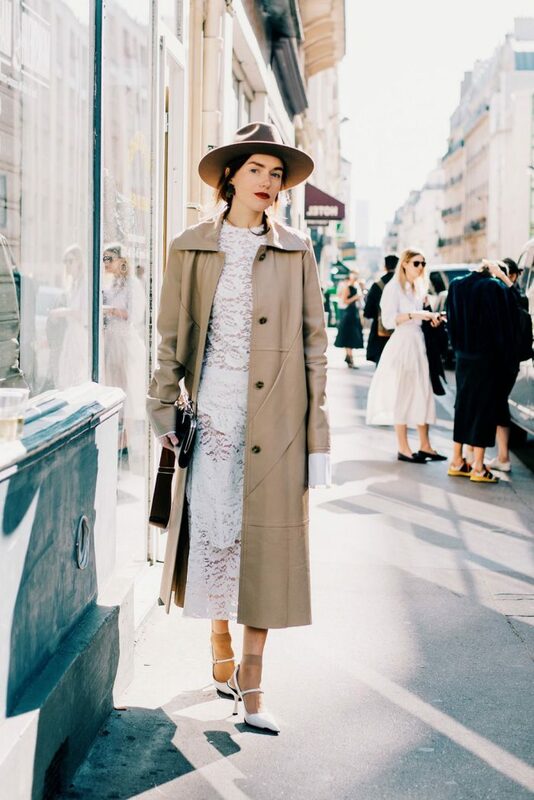 You will need a semi-sheer white lace dress, beige coat, wide-brim fedora hat, and white pointed-toe pumps.